Are You Being Sued for a Debt You Don’t owe? Have Debt Collectors Harassed You? Has Your Vehicle Been Repossessed When it Shouldn’t Have? Are You Angry and Frustrated? 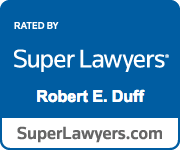 The Indiana Consumer Law Group/The Law Office of Robert E. Duff is here for you. Early in my career, I defended big companies like Wal-Mart, General Motors, Mitsubishi, Toyota and TransUnion. I saw how owning a lemon vehicle or having a credit report with errors that seemingly couldn't be fixed could devastate a person’s life. At the very least, it was an unwanted hassle that often left victims confused, angry and, most of all, frustrated. I can recall being excited and saddened at the same time because the plaintiff had chosen a less-than-skilled lawyer -- excited because it made my job so much easier, but saddened because I felt bad for the client who obviously didn't know any better. What's even worse is that all too often I was also saddened and angered to see that a plaintiff's lawyer seemed to be looking out more for the lawyer's interests ($) than the client's. That's not right, and it's one of the reasons I decided to open my law office. As an Indiana consumer lawyer, I believe that all litigants, big or small, deserve an even playing field in court. I also believe that consumers deserve a lawyer who will put their interests first. If you believe you can't afford to hire an Indiana consumer lawyer to bring a lawsuit against a debt collector under the Fair Debt Collections Practices Act (“FDCPA”), or bring a lawsuit for dealership fraud, unlawful repossession, or some other consumer rip off, you may be surprised. There are statutes that allow consumers to bring these actions and recover their attorney fees from the defendant. This means that if I agree to take your case, I can often do so without ever charging you a dime out-of-pocket for attorney fees. I hope you will browse my website and learn more about my law firm and the areas of law in which I practice (especially suing debt collectors for violations of the FDCPA, which has become my passion). I also hope that you will contact me if you believe that I can be of service to you as an Indiana consumer attorney. Does your credit report contain inaccuracies? Are you the victim of identity theft? Have to tried to resolve it with the credit reporting agencies without success? Click Here to learn more about the Fair Credit Reporting Act and how we may be able to help you. Think you have a lemon? Did you know that Indiana's lemon law only applies to motor vehicles in their first 18 months or 18,000 miles? Even if your vehicle is not covered by the lemon law, other laws may help where a seller or manufacturer refuses to honor their warranty. Click Here to learn more about your rights under Indiana and Federal law. Have you bought a new or used car recently from a dealer? Do you know that most dealership fraud is never detected by the consumer? Click Here to learn more about what dealership fraud is, how it occurs and what you can do about it.